Well, after a hiatus of six months the Costa Mesa Parks and Recreation Commission met for their first meeting of the year Wednesday night and it didn't take long for us to realize that this is NOT "your father's Oldsmobile" - as the old saying goes. In the absence of new City Clerk Brenda Green Recreation Manager Bob Knapp handled the swearing-in of the new/old members of the commission. Only Dean Abernathy was not required to take the oath of office. Carry-over Kim Pederson and former commissioners Byron de Arakal and Bob Graham were joined by the only real newbie, Don Harper. Then the new commission elected de Arakal as Chairman and Pederson as Vice Chair and we were off and running. de Arakal, who had served on the commission previously as Chairman, wasted no time exercising his control and kept things moving at a brisk clip. After a brief discussion of the first item on the agenda - a tree removal request that had been postponed from September - the commission voted to deny removing an obviously healthy, mature tree. Good move. Next up was the discussion of the renewal of the user agreement with the Harbor Soaring Society (HSS). The society requested an extension of 5 years to enable them to do more long-term planning. After a previous 5-year term, last year the commission recommended just a one-year extension. 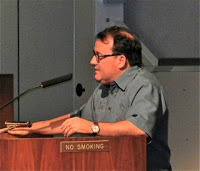 Following an acknowledgment of the contributions of the HSS to Costa Mesa for decades and the public service they provided, the commission followed de Arakal's reasoning - that because the Fairview Park Master Plan will soon be reviewed and it's not possible to predict just what changes for that park might result - in fairness to the HSS it would be better for them to be extended for another one-year term, then reassess the situation after the Fairview Plan is completed. That passed, 5-0. At 7:00 the commission began dealing with the item that brought most of the attendees to the chambers last night - the amendment of the Letter Of Understanding (LOU) with the Costa Mesa Bark Park Foundation. That conversation went on for more than an hour, with several supporters of the Bark Park Foundation stepping up to express their views. The commissioners went back and forth, negotiating a proper course of action. 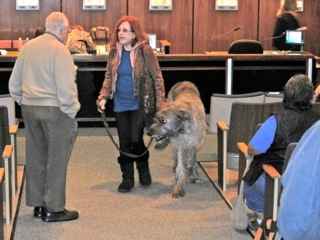 The result was a vote on the motion by de Arakal in which directed the staff to gather whatever archival information it needed and do an assessment of how much it will cost, and how long it will take, for the city to refurbish the Bark Park and maintain it henceforth. He also directed them to meet with members of the foundation and a sub-committee of the commission - de Arakal and Pederson - to determine whether, if the city takes over the maintanence of the Bark Park, there is a need for the Letter Of Understanding at all. These issues will be returned to the commission at the May meeting. No mention in the motion was made of the demand by Mayor Pro Tem Steve Mensinger at the last council meeting that the top positions on the Bark Park Foundation Board be occupied by Costa Mesa residents - a bogus and unnecessary petty demand in my view. It may be a moot point in May. I found it very interesting that Mayor Jim Righeimer found it necessary to step to the speaker's podium during Public Comments to give the new commissioners a pep talk. I don't recall that happening before - ever. And, I also thought it was interesting that Mensinger showed up and stayed through the entire meeting. One had the impression he was there to monitor the proceedings to be sure he didn't make a mistake when he nominated some of them. It smacks of micro-management. His lapdog, Jim Fitzpatrick, mosied in and out of the chambers for awhile, then left early for good. One thing is clear to me after last night's meeting. 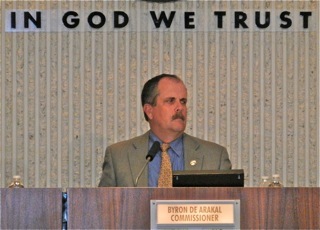 Byron de Arakal brings leadership not seen lately on the Parks and Recreation Commission - perhaps not since he last held that chair several years ago. Based on the bucket of tasks ahead of them, this is good news. He presented a vision that gave the commissioners an idea of where he thinks they should be headed. He mentioned the update of the city's General Plan and the need to update the Parks and Open Space Master Plan and the Fairview Park Master Plan - all of which will require significant attention by this commission as the city moves forward. He also slipped into his discussion a mention of moving forward with plans to fold Talbert Park into Costa Mesa - to "show the county we're serious". This is right out of Mensinger's playbook, so we'll see how that goes. Regardless, this will NOT be a moribund commission that sleep-walks through tree removal requests. Based on what I saw last night, this will be an energized, focused commission with diverse views on issues, which - with a meeting scheduled every month for the rest of the year (except December) - will likely tax the staff with requests for support and information. it is fantastic the councilmen Mensinger and Righeimer attended and gave respect to the commission. This has not happened before. Of course the minions will find fault with it rather than say "Where's Wendy"? These men spend untold hours at City Hall and around the community. We are blessed to have such commited councilmen. West calls it micromanaging of course. Would it be better that they just not be involved and up to speed as to what happens on the commissions and committees? Thank You councilmen. Tree roots are a major problem for sewer lines. Many residents have issues with tree roots from trees in the city's right of way that infiltrate their sewer line and they reach a roadblock with the city when they ask for assistance or tree removal. I am a nature lover myself but sometimes removal is needed for reasons that are not obvious on the surface. I have no idea if this is relevent in the case mentioned here. You're correct, but in this case roots were not the issue. The applicant failed to show up to plead their case, too. The record shows that they didn't like the mess the tree created. One kinda gets the feeling there is a plan for Fairview Park not revealed to general public. HMMMMMM! Football fields and parking lots. This is why they brought de Arakal back and why they stacked the PR Commission and will stack the soon to be new Fairview Park commission with their cronies. Make them do the dirty work so you look clean. de Arakal's comments were simply a ruse. He was so evasive and yet his squirming in his seat while hinting about it was so telling. Why not just rename Fairview Park, Pop Warner Park now? Kick out OCME and Harbor Society and make room for FOOTBALL Stadiums and parking lots. Thanks for your service to the community Byron. Well the Pop Warner community anyways. "it is fantastic the councilmen Mensinger and Righeimer attended"
Another big day in the sycophant community..
Riggy gives out shiny new dimes to all his followers on the planning commission. I certainly hope football fields aren't part of the Fairview park plan. Just last week I saw an endangered species of crane just roaming by the Pacific avenue entrance. The place is magic!